queen ketchup: Bad photo, delicious cookie. I baked cookies last Monday to mail off to Eric (they were a surprise so I didn't want make this post before he received them.) As I was mixing ingredients, I realized I had less than a tablespoon of vanilla to add..eek. I ended up subbing in about 1/8 tbsp almond extract and 1 tablespoon maple syrup. OMG SO GOOD. No, seriously. So chewy and I love the hint of almond! I put waaaaaay more chocolate chips than called for: 2 cups chocolate chips and 1 cup toffee pieces. I've posted the recipe in the comments section. Preheat the oven to 325 degrees F (165 degrees C). Line cookie sheets with parchment paper. 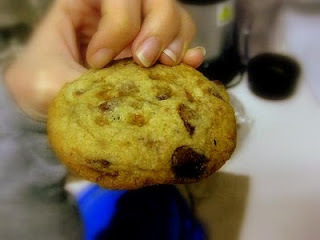 Stir in the chocolate chips and toffee chips by hand using a wooden spoon. Chill dough for at least one hour. Drop cookie dough by rounded spoonfull onto the prepared cookie sheets. Cookies should be about 2-3 inches apart. Bake for 15 minutes in the preheated oven, or until the edges are lightly toasted. Cool on baking sheets for a few minutes before transferring to wire racks to finish cooling.